John Rosemond talks about teens with his typical warm and wonderful humor. Great anecdotes about how he parented his own teenagers! Available only on Rosemond.com! 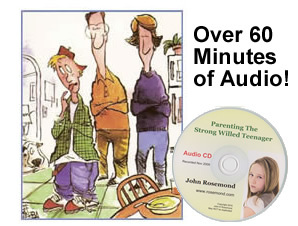 This audio CD is an entertaining and informative talk on understanding and managing even the most petulant of today’s teenagers. The talk was recorded live before an audience in San Diego, CA and is based on John’s best-selling book, Teen Proofing. Today’s parents approach the teen years with great anxiety and trepidation. These are the peer pressure years, the years during which the child begins to declare his or her independence and move toward emancipation. The problems that develop in the parent-teen relationship, says John, are usually due to parents who don’t want to give the teen enough freedom and a teen who wants more freedom than he or she can handle. Is there a middle ground? Yes, there is, and John describes it in terms of a macro-management style that focuses on the “Six C’s of Teen-Proofing”: curfew, cash, car, conflict, consequences, and colleagues (a.k.a. co-conspirators).